The entire Series has been protected by breeder rights. 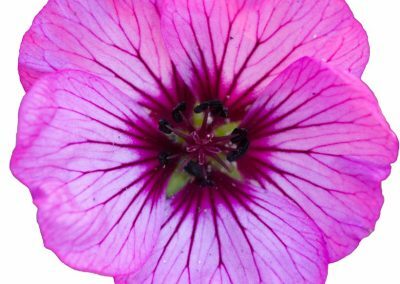 The genus Geranium belongs to the Geraniaceae family and there are believed to be approximately 500 species of Geranium world-wide. They thrive on every continent, from Europe to China, from Siberia to Alaska and they thrive in our gardens too. 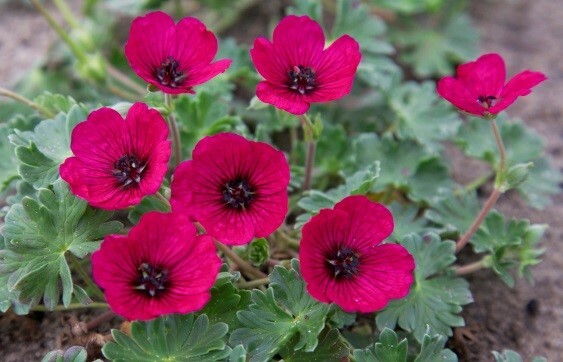 There are Geraniums for every site, always providing pretty flowers and attractive foliage. 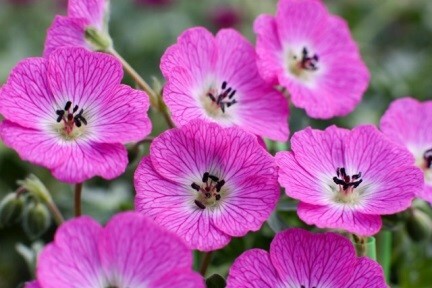 Anyone can grow Geraniums; they are healthy plants and generally free of pests. Small wonder they are very popular. 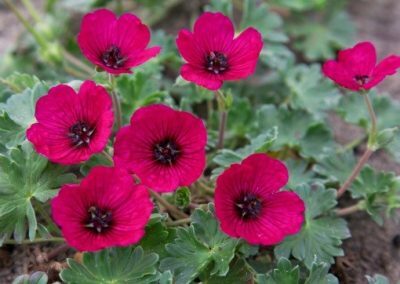 A species that is not fussy and is at home, in even the smallest of gardens is Geranium cinereum; all it needs is a sunny position and drainage. 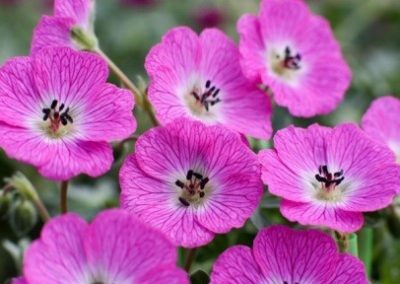 This is a hardy perennial that gets called ‘Ashy cranesbill’ due to its greyish foliage. It is often grown for low ground cover or in rockeries. 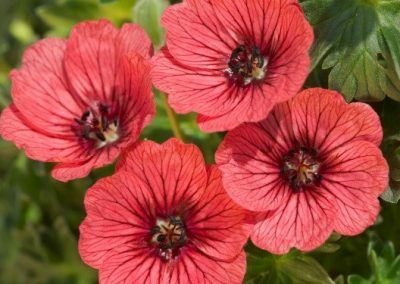 Geranium cinereum Jolly Jewels™ Series of plant breeder Marco van Noort is undeniably the most breath-taking introduction of the hardy Geranium cinereum group. 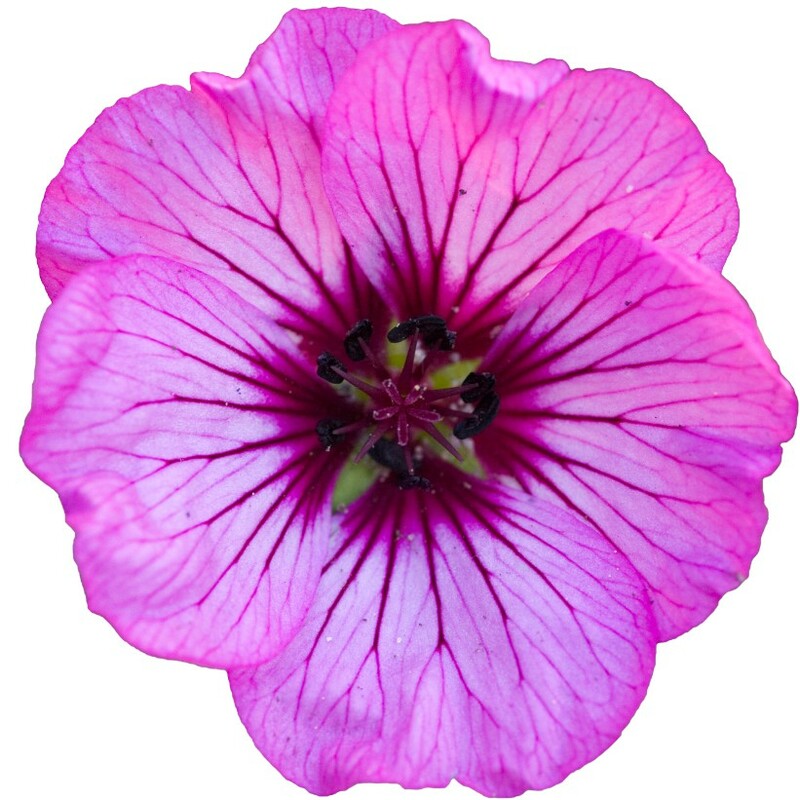 This Series derives from a breeding program of a ‘wild species of Geranium cinereum and Geranium cinereum subspecies’. It took years of breeding to reach the colour break-through of this Series. It has an admirable performance in the garden. The Series consists of 10 colours. Jolly Jewel™ Coral®, Jolly Jewel™ Hot Pink® Jolly Jewel™ Lilac®, Jolly Jewel™ Night®, Jolly Jewel™ Purple®, Jolly Jewel™ Raspberry®, Jolly Jewel™ Red®, Jolly Jewel™ Salmon®, Jolly Jewel™ Silver®, and Jolly Jewel™ Violet®. 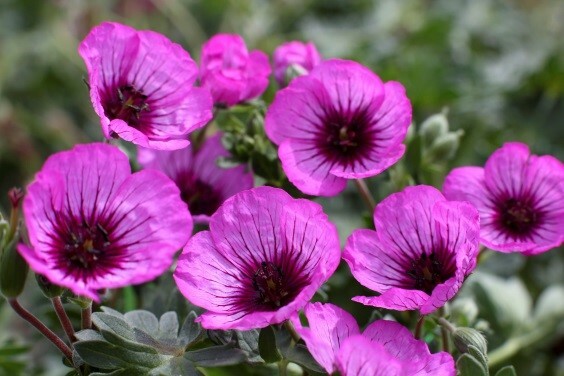 The name Geranium originates from ‘geranos’ the Greek word for Crane. It refers to the beak shaped seed capsule. The word ‘cinereum’ derives from the Latin word ‘cinis(cineris)’ which means, ash, referring to the grey, mat colour of the leaves. 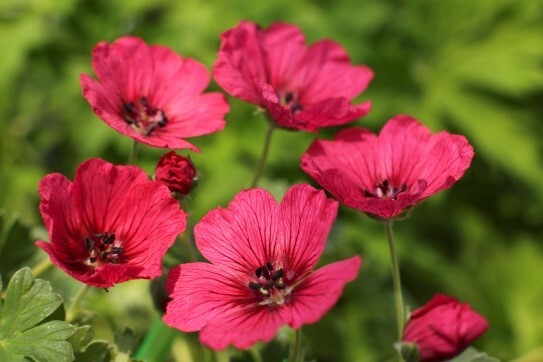 Geranium cinereum is semi-evergreen which means it provides interest all year. Each season has its own charm and attractiveness. as Summer, Autumn, Winter and the Spring”. 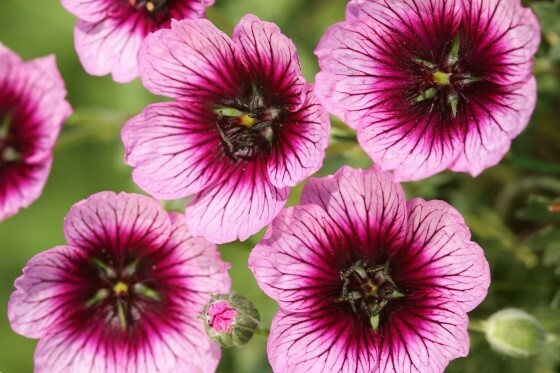 Unfortunately, there is some confusion about the name Geranium. 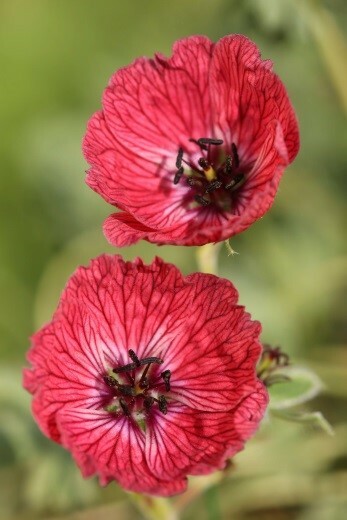 The genus Pelargonium, which comes from the Greek word ‘pelargus’ is frequently referred to as Geranium. The mix-up can be traced back to the eighteenth century and though both are members of the same plant family, Geraniaceae, they are very different. 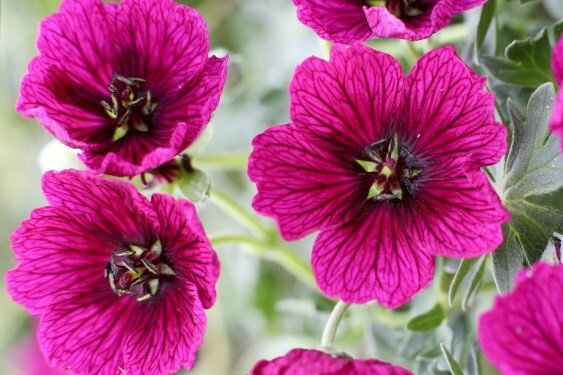 Pelargoniums are ‘annual’ Geraniums and are only half-hardy, being frost tender plants. The habit of gardeners to call those tender southern African plants ‘geraniums’ is deeply rooted, but they could not be more different than the hardy Geranium. It was the Dutch botanist and physician Johannes Burman – 1707-1780 – an appointed Professor of Botany in Amsterdam, who distinguished Pelargonium as a group, a genus, separated from the genus Geranium. 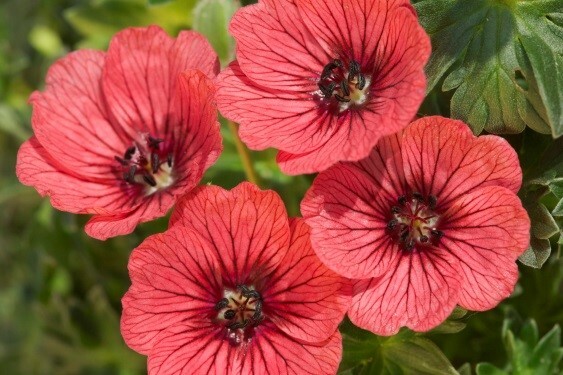 This new Geranium cinereum Jolly Jewels™ Series deserve a place of honour in the perennial garden. Hardy Geraniums are versatile, reliable and provide a fantastic punch of colour for a long period of time. They are low maintenance and easy to grow perennials. They give a lot and require very little. The famous gardener Margery Fish, author of 8 books about gardening once was asked for the secret of gardening. 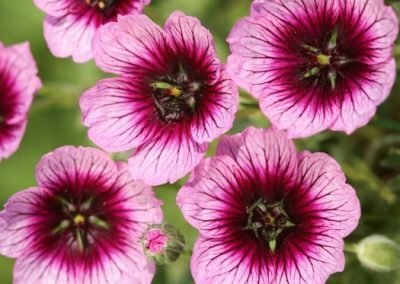 She answered: ‘The secret is, when in doubt, plant a Geranium’, meaning that you will never be disappointed when you choose a Geranium. 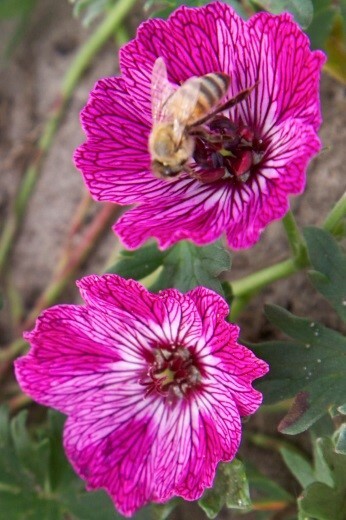 The Jolly Jewel™ Series is amazingly floriferous, are great for groundcover, drought tolerant and attractive to bees. 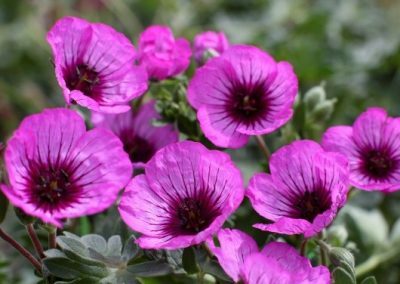 The deeply cut leaves, forming a low-growing clump of pretty, charming, ornamental foliage is a bonus of the Jolly Jewel™ Series of Geranium cinereum.